Travelling within Europe is generally smooth and easy for people travelling around the 27 countries of the European Union. You can cross many borders within the Schengen area without any formalities. Additionally, the Euro makes both travelling and shopping much more convenient in the countries that have introduced this joint currency. Take advantage of all that is on offer and note that 6 of the 10 most visited countries in the world are European nations. Here is a list of the European countries that are in the list of top 10 most visited countries worldwide. A well preserved cultural heritage, open borders and efficient infrastructure makes visiting Europe easy, and rarely will you have to travel more than a few hours before you can immerse yourself in a new culture. Although Europe is the world's smallest continent in terms of land surface area, there are profound differences between the cultures and ways of life in the various European countries. Documents you will need if travelling in Europe. There are no longer any frontier controls at the borders between 22 EU countries which form the Schengen Area. This is thanks to the Schengen rules which are part of EU law. These rules remove all internal border controls but put in place effective controls at the external borders of the EU and introduce a common visa policy. All EU countries are full Schengen members except for Bulgaria, Cyprus, Ireland, Romania and the United Kingdom. Iceland, Liechtenstein, Norway and Switzerland are also Schengen members but are not members of the EU. You will therefore need to present a valid passport or ID card when travelling to the five non-Schengen countries and when entering or leaving the EU at it's external borders. You should also carry them when travelling within the EU because they may be required for identification or security purposes. Be aware that the only documents valid for travel are either a Passport, or a nationally issued citizen ID card which has been endorsed for international travel by the issuing state. Make sure that any children travelling with you have their own passport or ID card to travel. You will not need a visa for travel within the EU. You will need a valid passport. There are 42 countries whose nationals do not need a visa to visit the EU for three months or less. These include Australia, Canada, Croatia, Japan, New Zealand and the United States. The list of countries whose nationals require visas to travel to the United Kingdom or Ireland differs slightly from other EU countries. We can help to apply for a visa. Contact us if you need our assistance. Border officials in EU countries may ask for other supporting documents such as an invitation letter, proof of funds and accomodation, return or round-trip ticket. For the precise requirements contact us. The euro is the legal currency of around 331 million people in 17 EU countries: Austria, Belgium, Cyprus, Estonia, Finland, France, Germany, Greece, Ireland, Italy, Luxembourg, Malta, the Netherlands, Portugal, Slovakia, Slovenia and Spain. 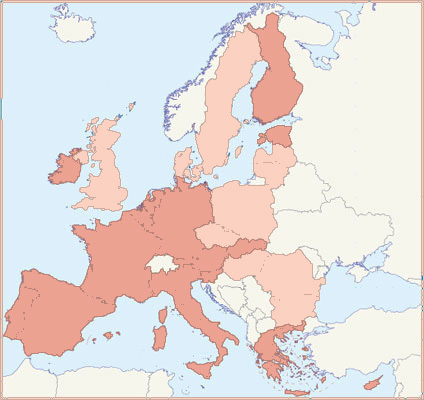 EU countries not using the euro are Bulgaria, the Czech Republic, Denmark, Hungary, Latvia, Lithuania, Poland, Romania, Sweden, United Kingdom - although on January 1st 2014 Latvia will officially begin using the Euro. This is a map showing where Euro is used and where other currencies are in force. A valid driving licence issued in an EU country is valid throughout the EU. In some countries, in addition to carrying a valid driving licence, you will need to have your vehicle registration document with you. Wherever you are travelling in the EU your car insurance policy will automatically provide the minimum cover (third party liability) required by law. This also applies to Iceland, Liechtenstein and Norway. If you have comprehensive insurance at home, check that the cover extends to travelling in other countries. In all EU countries seat belts must now be worn in all vehicles, including tourist coaches and minibuses. Children must also have appropriate child restraints in cars and lorries and, where possible, in other vehicles as well. Using a mobile phone while driving greatly increases the risk of an accident and it is either explicitly or implicitly forbidden in all EU countries. There are toll roads in many countries including Austria, the Czech Republic, France, Greece, Hungary, Ireland, Italy, Poland, Portugal, Slovakia, Slovenia, Spain and the United Kingdom. Payment of tolls in some countries (Austria, Czech Republic, Hungary, Slovakia and Slovenia) is by 'vignette' or toll label which has to be affixed to the windscreen. Bus and coach passengers will enjoy new rights wherever they travel within the EU from 1 March 2013. All passengers will have the right to receive adequate information. Passengers travelling 250 km or more will have additional rights such as assistance, reimbursement or rerouting in case of delay and cancellation. Passengers with a disability or reduced mobility will get free assistance at terminals and on board buses or coaches. Creating a single European market for air transport has meant lower fares and a wider choice of routes and services for passengers. As an air passenger you have certain rights if your flight is delayed, cancelled or if you are denied boarding. These rights apply to all scheduled and chartered flights, both domestic and international, when departing from an EU airport (or from Iceland, Norway and Switzerland). When arriving at an EU airport from a non-EU country, they apply only to flights operated by an airline licensed in the EU (or Iceland, Norway and Switzerland). Air carriers are liable in the event of accidents or for lost, damaged or mishandled luggage. In order to ensure a high level of security throughout the EU, common rules and standards have been laid down for such things as passenger security controls, hand luggage and checked luggage, when departing from EU airports. The EU has over 212 000 km of railways with extensive international passenger services. There are over 6 000 km of high-speed lines in several countries with trains reaching speeds of up to 350 km/h and the network is being extended with new links in Austria, Belgium, France, Germany, Greece, Italy, the Netherlands, Portugal, Spain and the United Kingdom. Huge financial support is going into trans-European projects such as enhancing the rail links from Rotterdam to Genoa, Lyon to Hungary’s border with the Ukraine, from Stockholm to Palermo, from Dresden to Bucharest and from Warsaw to Tallinn. There are many key sea routes between EU countries offering regular, high-quality services as an alternative to, or in combination with, road, air or rail. There are also 41 000km of navigable inland waterways in 20 of the 27 EU countries. Enjoy a sea or river cruise or use the water as a practical and pleasant way of getting around. If you plan to use the metro, familiarise yourself with maps of European city metros. Take advantage of the burgeoning number of self-service bike rental schemes running in cities including Paris, Brussels, Barcelona, Copenhagen, London and smaller towns and cities across Europe, some of which, such as Aalborg in Denmark, Krakow in Poland and Burgos in Spain, have been co-financed by the EU. For biking enthusiasts the European Cyclists’ Federation is developing EuroVelo, a network of 14 long-distance cycle routes across Europe covering over 70 000km. Most of the languages of Europe belong to the Indo-European language family. This family is divided into a number of branches, including Romance, Germanic, Baltic, Slavic, Albanian, Celtic, Armenian and Greek. The Uralic languages, which include Hungarian, Finnish, and Estonian, also have a significant presence in Europe. The Turkic and Mongolic families also have several European members. As for European Union the institutions of EU have 23 official languages but there are many other lesser-spoken ones.